Some people think that personal success can be measured in bucks, clicks, +1s, or Likes. So I won’t be surprised if somebody wants to visualize his personal value with a chart created with Apple’s spreadsheet app Numbers for iOS. Create a new spreadsheet within Numbers. Create a table (table 1, top left) and enter the months and the corresponding number of bucks or clicks in a month. The last row should contain the sum. It’s needed to display the relative amount of success (the ratio bucks / total x 100). Create another table (below the first table). This table isn’t really needed but usually it’s worth to separate the data from its visualization. Refer to the the first two columns of table 1 by using terms like ‘=Table 1::A1’. This will show the months and the absolute values of bucks. Now let’s create the crux of the matter. 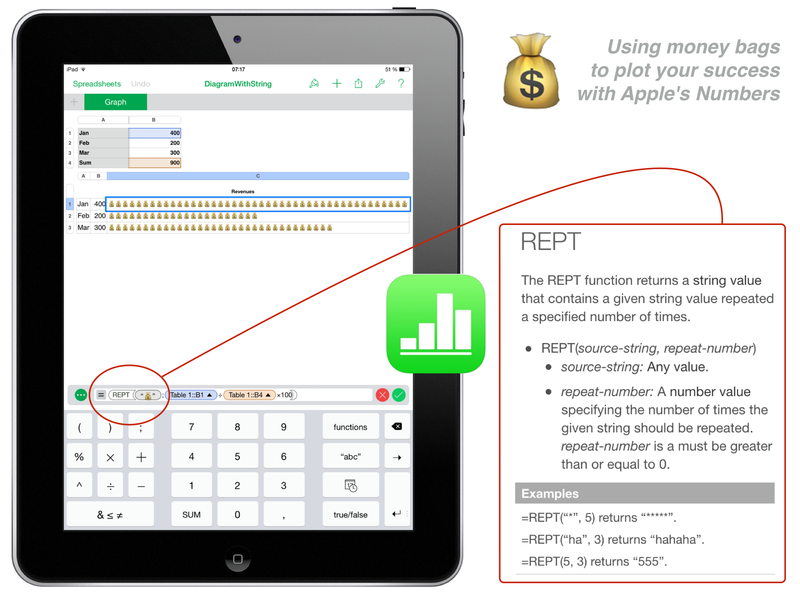 Use the built-in function REPT (Repeat) with the money bag (from Apple’s Emoji keyboard; activation via Settings – General – Keyboard – Keyboards – Add New Keyboard and select Emoji). Refer to Apple’s excellent help for this function and all the others to understand the parameters. Use it and you will see that Numbers for iOS is perfectly adapted to touch screens. If you want to refer to a cell of an other table in a function, just tap on it instead of entering the table number and the coordinates. That’s perfect user experience, isn’t it? Now your visualized success is always with you, on an iPhone, an iPad, or an  Watch. I suggest to publish your stats quarterly on the internet like Apple does in its U.S. Securities and Exchange Commission (SEC) filings. The usage of functions in Numbers is explained in meaningful helps. An alternative is to enter the values in a table and use the feature Create Chart from Table. But that would be too easy. Always following the KISS principle doesn’t help you to improve your knowledge.